Managed service providers (MSPs) and IT consulting firms often face a variety of business development challenges around finding clients, retaining those clients, and growing revenue. Just a few short years ago, it made sense for MSPs and IT consulting firms to use a lot of outbound, traditional, interruption-centric marketing to get in front of the right decision makers. However now that as much as 70% of the sales cycle is over before most prospects are ready for a conversation, your company either gets found early or it's totally irrelevant to the consideration set. Joshua helps MSPs and IT consulting firms grow their leads, client base, revenue, and profitability. As a HubSpot Certified Partner and former Microsoft content provider and IBM sales rep with over two decades in technology marketing and sales enablement, Joshua is especially focused on helping clients differentiate, get found early on in the sales cycle, achieve trusted advisor status, and command premium pricing power to drive sustained, profitable, revenue growth. 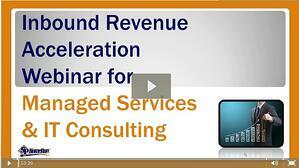 Complete the form on this page to get access to the recording from the "Inbound Revenue Acceleration Webinar for Managed Services & IT Consulting."